Research suggest that baited traps act as lobster fertilizer. Is that a good thing? Despite the uncertainty, though, one of the most intriguing theories is supported by a solid body of evidence. 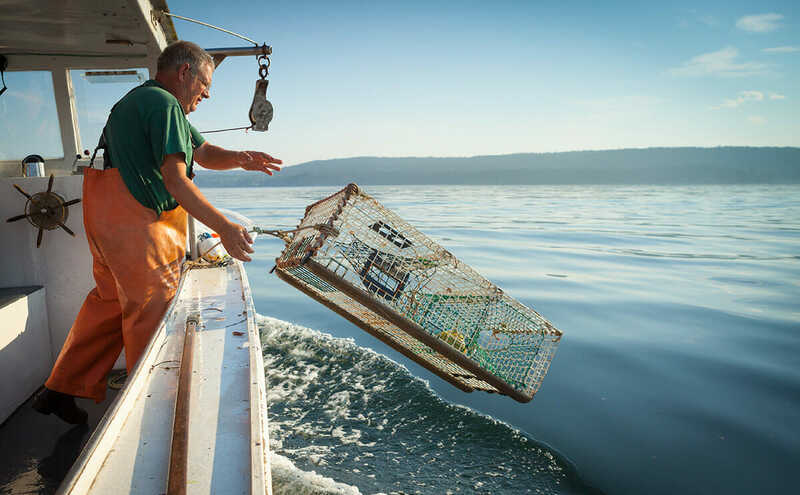 The big idea: That lobstermen have less in common with fishermen than with farmers, cultivating their undersea crop with steady infusions of fertilizer – and, like any large-scale agricultural operation, changing the ecosystem in which they operate. To understand why, you need to know something about how a lobster trap works. It’s a simple but effective device, a labyrinth of hoops and mesh designed to funnel the critters from a “kitchen” – the first compartment, where the bait, usually herring, is hung – into a second, inescapable chamber called the “parlor.” In practice, however, there’s not much preventing lobsters from entering the kitchen, grabbing a herring snack, and heading out the way they came in. Lobstermen have less in common with fishermen than with farmers. Homarus americanus, it was clear, was dining and dashing. But what did that mean for lobstermen? It fell to another scientist, a marine ecologist named Jon Grabowski, to answer that question. Grabowski, then with the Gulf of Maine Research Institute (today he’s at Northeastern University), had long heard lobstermen speculate that they were effectively farming their catch. Big lobsters were escaping traps, small ones were being thrown back with stomachs full of herring, and lobsters of all sizes fed on wads of discarded bait. “Lobster farming was one of those things that was widely believed by the industry, but there hadn’t been a ton of research,” Grabowski told me. To test the idea, Grabowski looked to the waters around a rocky speck called Monhegan Island, where every year the lobster fishery closed for six months to let its quarry grow unmolested. Sure enough, when he compared Monhegan lobsters to their counterparts from more densely fished areas, he discovered that lobsters with year-round access to traps grew a full 15 percent faster. (Unsurprisingly, they also had more herring embedded in their tissues.) The free lunches weren’t producing more lobsters, but they were making the existing ones grow faster – and reach harvestable size sooner, contributing to lobstermen’s prodigious hauls. Herring was acting as a sort of Miracle-Gro. When Grabowski crunched the numbers, he found the inadvertent applications of fertilizer were augmenting Maine’s lobster landings by up to $25 million a year – equal to the value of New England’s vaunted cod. Accidental farming doesn’t explain the lobster boom by itself, but “it adds up to a substantial uptick in a very important fishery,” Grabowski says. The free lunches weren’t producing more lobsters, but they were making the existing ones grow faster. Whatever their cause, will the good times continue? Perhaps not: There’s evidence that the lobster boom, like housing and tech and Dutch tulips before it, may actually be a bubble. The Gulf of Maine’s rapidly warming waters are helping to fuel the bottom-dwellers’ growth for now, but scientists fear the Gulf will soon get too hot for many species. When the Long Island Sound’s waters warmed beyond a critical threshold in 1999, its lobsters began dying off, and never recovered. To the mind of Steneck, who in the 1980s calculated that lobster diets consisted of 80 percent bait, the situation in the Gulf of Maine has come to resemble a monoculture, and lobsters the cash crop that has trumped all other fisheries. He’s quick to add that the lobster industry, which he says has “one of the strongest conservation ethics on the planet,” isn’t to blame. But while the monoculture isn’t lobstermen’s fault, it might turn out to be their problem: what happens when the boom goes bust?